HAVE COOKED BACON SEVERAL TIMES ON IT!. REHEATED FRIES AND COOKED CHICKEN PATTIES! ALL CAME OUT GREAT AND TOTALLY NO STICKING!! Bacon without burns and stuck on bits. French fries without mush, only crunch. Cleanup without green gross scrubbers only my hand knitted dishcloth, soap and warm water. Yes, I love my new copper coated pans! And they look great on my countertop! I reheated fried chicken that I'd purchased and refrigerated. The chicken was nice and crisp and heated through perfectly. I've also heated h'doerves that needed to be baked and again they turned out wonderfully. Additionally, I've used the basket as a drainer when I'm cleaning fresh vegetables and it does double duty for that and the underneath pan worked great when I baked some refrigerated (in a tube) rolls for supper. The crisper pan is great!! Many times we have french fries to bring home after eating out or some other type of food that needs not only re-heating, but needs to be made crispy again. This crisper pan is great; and very little clean up after use. I had one of my own n loved it, so I bought one for my mother for Christmas. The design of this pan combo allows air to cook the underside of foods. I haven't use it much but to sear some shrimp. It worked perhaps too well as I didn't have a lot of butter on the shrimp but they got crisped. I also used the bottom pan to bake home-made granola in, and it worked fine. I don't what percent of copper the pans are made of; they look a little less than orange than my Revere Ware pans. 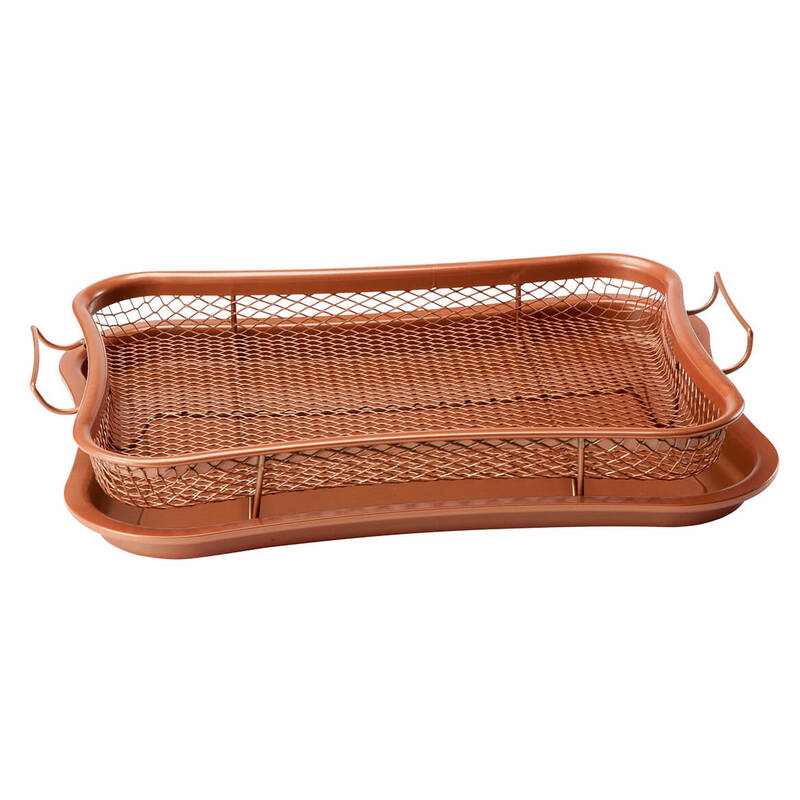 I used this pan "Copper Oven Air Crisper" 3 times since i received it. I cooked according to instructions for items , each time the food did not come out crispy at all. This is for my daughter. I have one and l love it! It works just like the more expensive plug in type. It seems like a simple and convenient way to attain food crisping. Sounds like it would be a good way to have french fries without the grease. Hoping it will prove to be the perfect choice to cook without oil.It will help me to enjoy my food while dieting. I like the copper items and I just threw out my old pan that I use for oven cooking. There are only two people in our household and this appears to be a good size for us. wanted to try this because I don't use oil to fry my fries. I would like to try this item for the first time. I do a lot of baking and this seems to eliminate some of the clean-up. I chose this product, because I have changed to a healthier eating habit. I love fried foods and want to make them in a healthier way. Hopefully, this will be a more inexpensive way to satisfy that craving. I've been wanting to try one of these for some time. Hopefully it will live up to the reviews and make my frozen fries crispy! Looks like it will be great for my grandson's "nuggets and fries"! My wife thinks we need this at our age. I wanted a crisper that I could use in the oven for french fries, wings and the like so that I could avoid using oil or butter. I love the way it cooks. Sounds like a healthier way to fry. You don't have to use grease to bake anything . to see if it really works like they say. Sent one to my daughter, she loves it. I own the pots & pans copper and I am really impressed with the easy clean up. I decided to try this because I am not able to eat fried foods and thought this would be a better, healthier way of cooking. I already have one and it's wonderful. can this copper pan be used for baking cookies? BEST ANSWER: Yes. Just remove the basket. The pan is non stick. I have not tried to bake cookies yet. I would think it would be OK since it cooks all around. I have cooked pizza rolls & French fries so far. I've only had it a week. I do wish they would make one that would fit in a toaster oven!! Sometimes I don't want to turn on the big oven (especially in the summer) & only cook enough for me. I believe you can, don't see why not. BEST ANSWER: Thank you for your question. The air crisper is made from aluminum and stainless steel. We hope this information will be of help to you. BEST ANSWER: Thank you for your question. The basket is made from both stainless steel and aluminum. We hope this information will be of help to you. 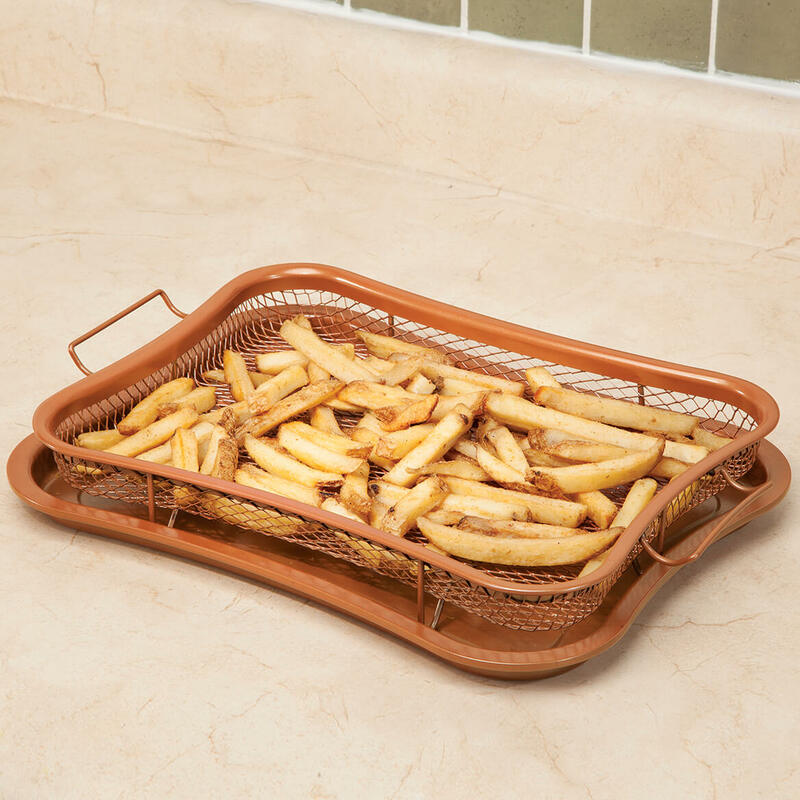 recipes for copper over air crisper How to use, length of cooking ie fries ?? ?